Sue (Susie Mae) Goerzen: educator, mentor, visionary, was born 23 May 1925 in Corn, Oklahoma, USA. She was the youngest of five children born to Peter P. Nikkel (2 November 1885-7 February 1941) and Katrina (Nickel) Nikkel (11 June 1882-20 March 1960). Sue was baptized in 1941 in the Corn Mennonite Brethren Church in Corn, Oklahoma. Susie Mae Nikkel married Gerhard Goerzen (30 June 1926- ) on 23 July 1960 in the Corn Mennonite Brethren Church. Sue and Gerhard had two children, John and Mary. Sue died 14 January 2006 in Harrow, Ontario. Sue attended high school and Bible school in Corn, Oklahoma. She continued her studies at Tabor College in Hillsboro, Kansas, followed by Southwestern State Teachers College in Weatherford, Oklahoma, where she graduated with a BSc in Home Economics in 1949. She did graduate work in the summers at San Jose State College in San Jose, California, finishing at Kansas State College, Manhattan, Kansas, with a MSc in Home Economics in 1956. She took one post-graduate course at Harvard University. Sue taught in high schools in Kansas and at Tabor College in the years 1949 to 1960. She married and moved to Ontario in 1960 and taught in several high schools in Detroit, Michigan, from 1961 to 1968. She became professor of Home Economics at the University of Windsor where she worked from 1969 until her retirement in 1990. She was awarded the University Teaching Excellence award in 1990 from the University of Windsor. Sue Goerzen was very involved in the Harrow Mennonite Church on various committees and as deacon, teaching the youth Sunday School class for 28 years. She was the first woman to speak from the pulpit in many Mennonite churches in Ontario. She sat on the Conrad Grebel University College Board from 1992 until 1999. For many years Sue was the parliamentarian for the Conference of United Mennonite Churches in Ontario. She was involved in the Education and Family Life Committees for the Ontario Conference. Sue also helped to establish the Windsor Mennonite Fellowship. She was a leader in Christian interpretation and discussion of healthy relationships and sexuality among adults and youth within the Mennonite Church and General Conference Mennonite Church. Sue was a leader in helping churches understand divorce and remarriage issues in the 1970s and 1980s, and homosexuality in the 1980s and 1990s. She co-chaired the Mennonite Church and General Conference Mennonite Church Task Force on Human Sexuality in the Christian Life from 1981 to 1988. Sue Goerzen co-authored the publications Teens and Sexuality, Marriage Preparation, and Human Sexuality in the Christian Life. Amid the racial tensions of the late 1960s, Sue taught mostly African American students in Detroit. In April 1968, on the day that Martin Luther King, Jr. was killed, a student mob came to attack the white teachers at the school where she was teaching. When they came to her classroom, a group of her male students formed a circle around her, drew switchblades to challenge the mob, and then they escorted her to her car. That day, three white teachers were killed and seven were injured. Later, when the violence had settled and Sue returned to school, she asked her students why they had protected her. Their answer, "Because you are our friend." She then used the opportunity to discuss the outcome of the violence in the school in relation to the words of Martin Luther King, Jr.
Sue was an educator, mentor and visionary. She had a tremendous capacity to listen to others, and to see the good in people. For Sue, loving God meant loving others. "Goerzen, Sue". The Windsor Star (16 January 2006). “Susie Mae Nikkel.” Grandma’s Window 5. California Mennonite Historical Society Genealogy Database Project. 8 October 2009. Web. 12 February 2019. https://grandmaonline.org/guest?IND5=42929. Klassen, Maria. "Goerzen, Susie Mae “Sue” (1925-2006)." Global Anabaptist Mennonite Encyclopedia Online. February 2019. Web. 18 Apr 2019. http://gameo.org/index.php?title=Goerzen,_Susie_Mae_%E2%80%9CSue%E2%80%9D_(1925-2006)&oldid=163224. Klassen, Maria. (February 2019). 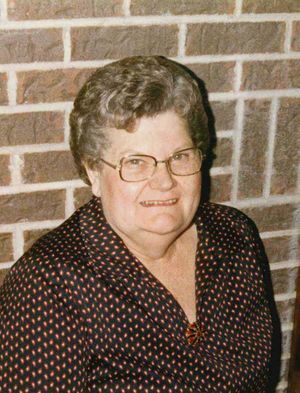 Goerzen, Susie Mae “Sue” (1925-2006). Global Anabaptist Mennonite Encyclopedia Online. Retrieved 18 April 2019, from http://gameo.org/index.php?title=Goerzen,_Susie_Mae_%E2%80%9CSue%E2%80%9D_(1925-2006)&oldid=163224. This page was last modified on 15 February 2019, at 11:22.